I actually hit my weekly milestones on Fridays, but because life is super busy, and because I rarely wear makeup on the weekdays, these will most likely come on Mondays (it's on Tuesday this week because I wasn't about to steal Connor's thunder on his birthday). How Far Along: 12 weeks, 4 days. Size of baby: The baby is the size of a lime, just over 2 inches long and weighs half an ounce. Total Weight Gain/Loss: 3 pounds. 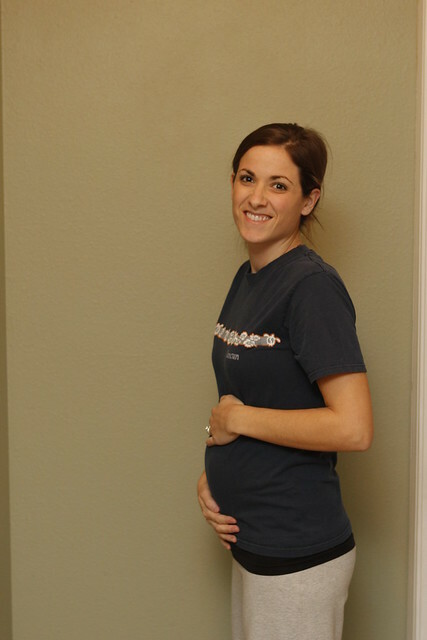 Maternity Clothes: I can still wear most of my non-maternity pants with ease. I'm starting to prefer maternity tops because my belly is too big for most non-maternity tops (please see picture above for reference ;) ). Movement: too early for that, but I can't wait, as it's my favorite part of pregnancy! Sleep: If I'm honest... it's awful. I sleep well for about 3 hrs, then have to wake up to pee, and can never really fall back asleep. I never had this problem with the boys, which is so strange. Symptoms: nausea. I had a fun bout of vomiting yesterday while shopping at Walmart- definitely my most humbling pregnancy experience to date. Serious fatigue. Probably from the lack of good sleep as well as the progesterone that I am on right now. Only 1 more week of progesterone! I've also started to have TERRIBLE headaches. Friday night it was so bad that anytime I moved, my head would POUND. Praying that this is not something that stays with me for the next 28 weeks. What I miss: sleep and being able to eat whatever I wanted. Cravings: I've not really had any weird cravings lately (at the beginning of the pregnancy I craved Taco Bell bean burritos, which was disgusting). Food Aversions: it changes by the hour. I feel like it's getting better though. Best Moment this week: Having Brayden ask more questions about the baby. I love how he can understand it this time around! What I am looking forward to: I can't wait to start feeling this baby move and to find out what we're having! I also am ready to feel more myself-- constant nausea and fatigue have not made me the funnest person to be around lately.